Economics and geology were close bed-fellows. By understanding the patterns and meanings of the Earth’s structure geologists helped open up the value of the landscapes below. Minerals and mines became increasingly lucrative resources that fed commercial interests. 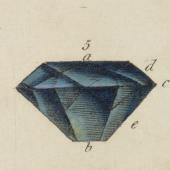 The crystalline forms of precious gemstones provided a way of studying the fundamental elements of the physical Earth. While chemical analysis in the laboratory offered new insights, mapping remained an important aspect of practical geology. Landed gentry and industrial merchants saw the practical understanding of stratigraphy for coal mining as an economic tool. Private individuals and government bodies regularly commissioned surveys to improve wealth and assess the value of land.